The next horror film is sometimes considered a horror film, but not really. Director F.W. Murnau (John Malkovich) yearns to create the most terrifying vampire tale imaginable. Unknown actor Max Schreck (Willem Dafoe), cast as the vampire Count Orlock, makes an impressive debut as filming begins, even as he hides an unearthly secret, the secret that he is secretly is a vampire. Shadow Of The Vampire, is a reimagianing and also look behind the scenes, of the making of the silent film 1922 classic Nosferatu. I usually don’t like these movies where they tell just false stories about something big, but for this film I let that slide and I actually got a good experience from it. Shadow Of The Vampire contains more humor than I expected, as well as the backstage movie lore, with an underlining but focused horror story. It’s a lot to get into one story, and sometimes the progress the film goes through is a little uneven. At many points, there was a little too many blood and gore for a film of this nature. It turned me away from the film and I didn’t know whether or not to laugh or be frightened by Count Orlock, as I didn’t find him scary nor compelling. I thought the setting was very eerie, as they were on the island all by themselves making this film, but I didn’t feel much tension throughout many of the scenes. This lack of tension also made the last 20 minutes of this film seem very predictable and just a bit tedious. I liked the way the film was directed however. I felt like many of the scenes actually did mean something and they weren’t just put in to add a scene, and show how it ended up in Nosferatu. The scenes where you get to see how the scenes are filmed, by Malkovich were very funny and also very amusing. Willem Dafoe is what really makes this film for what it is, he looks, acts, and just feels like Max Schrek. After this film, I actually looked at some old shots from Nosferatu and I was really astonished by how much Dafoe basically embodied the life and soul of Schrek, but also not forgetting to be creepy. Also, Joh Malkovich is dry, self-centered, and overall in mannered as the director, and really does capture a director that does start to obsess with getting his work done and out there. 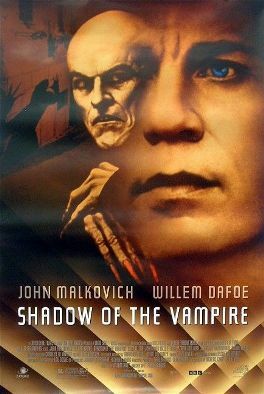 Consensus: Though it has some rough editing, Shadow Of The Vampire is funny, creepy, and overall a good look at the filming of Nosferatu, with an incredible performance from Dafoe.